About The Winns of Fairfield County: Brothers William, Col. John, and General Richard Winn migrated from Fauquier County, Virginia to Fairfield County in the years just preceding the Revolutionary War. All three, along with several sons, fought for the Patriot’s cause with the local militias. In 1785 the brothers petitionedfor a charter and laid out the town on the site of the early village. Early merchants and surveyors, the town of Winnsborough (now Winnsboro) was namedin honor of this founding family. Mr. Chappell was a Winn descendant. About Captain William Boykin Lyles Estate Record Ledger: The Ledger was the estate record of Captain William Boykin Lyles. His father Thomas Minter Lyles kept the records for several years for the widow. The Fairfield County Lyles properties encompassed several plantations in the farming community called since colonial times Lyles Ford at Beaver Creek on the Broad River (It is now known as Blair). Thomas Minter in the slave censuses of 1850 and 60 was noted as having over 180 slaves and being one of the largest slave owners in the area. 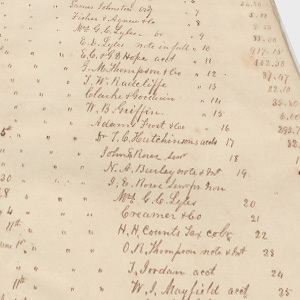 Remarkable is the list of the 70 slaves belonging to Boykin Lyles’s estate showing their ages and values. Also, debts and debtors listed in the accounting pages show the newspapers subscribed to, artisans contracted, and businesses dealt with during this period of Upcountry plantation economy and culture. Boykin was born Nov. 23, 1835 and was killed in battle at Seven Pines on May 31, 1862. About Family Bible Records: The Family Bible Records of Faifield County detail births, deaths and other significant events as recorded by family members. Additional Bible records will join these as the collection grows.